Waiheke Island (/waɪˈhɛkiː/; Māori: [ˈwaihɛkɛ]) is in the Hauraki Gulf of New Zealand, about 17.7km and a mere 35-minute ferry ride from downtown Auckland. Waiheke Island, known as the ‘Island of Wine’ and home to over 30 wineries and some of the best boutique cellar door experiences in New Zealand. Waiheke wines have won numerous trophies and awards, both locally and internationally. Its traditional strengths lie in Bordeaux blends and Syrahs, but its Chardonnay, Viognier, Sauvignon Blanc and Pinot Gris wines are garnering increasing critical acclaim. With cellar doors offering everything from simple tastings to five-star restaurant experiences, Waiheke has options for all palates and budgets. It is the second-largest island in the gulf, after Great Barrier Island. It is the most populated, with nearly 8,730 permanent residents plus another estimated 3,400 who have second or holiday homes on the island. The island has a thriving artistic community where over a hundred working artists ply their trades in disciplines such as sculpture, glass blowing, painting and woodwork. Waiheke is an outdoor enthusiast’s playground, where mountain biking, sea kayaking, kitesurfing, fishing and sailing can all be enjoyed. It is the most accessible island in the gulf, with regular passenger and car ferry services, a Waiheke-based helicopter operator, and other air links. In November 2015, Waiheke Island received international attention when it was rated the fifth best destination in the world to visit in 2016 by Lonely Planet and also voted the fourth best island in the world in the Conde Nast Best Islands in the World List. Oneroa Beach – The main beach, on the northern side of the town of Oneroa. Little Oneroa Beach – A small secluded beach at the east end of Oneroa Beach, separated by a protruding cliff wall. Palm Beach – Similar in shape to Oneroa Beach (complete with protruding cliff wall at the east end that separates a small private beach in Boatshed Bay), it gets its name from the mature phoenix palms at the east end. Little Palm Beach – A small “clothes-optional” beach at the west end of Palm Beach. Blackpool Beach – The south-facing counterpart of Oneroa Beach, lining Blackpool and popular for kayaking and windsurfing. Surfdale Beach – A zoned-in beach on the southern side of Surfdale, separated from Blackpool Beach by a small protruding peninsula, which has a scenic unsealed route called The Esplanade linking the beaches. Popular for kitesurfing. 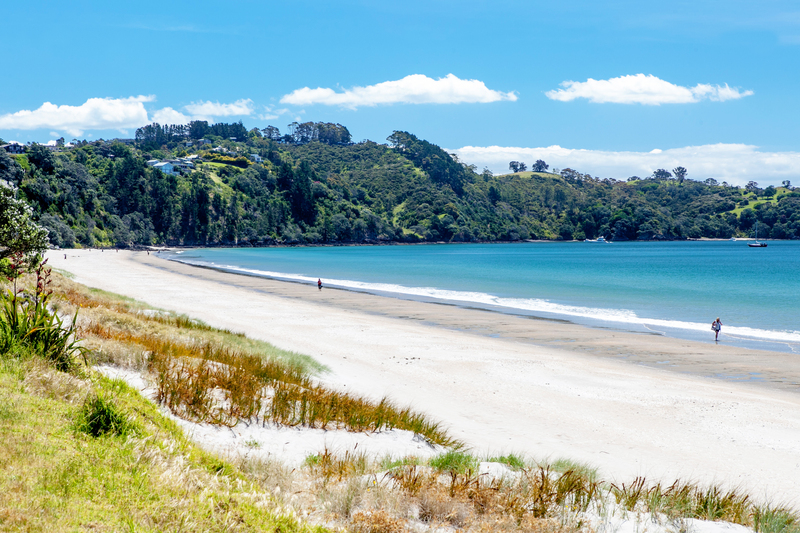 Onetangi Beach – A 1.87 km long, north-facing beach lining Onetangi. For many years it has been the site of the Onetangi Beach Races. Its western end, often inaccessible at high tide, is clothes-optional. It has sandcastle building contests annually; participants have a few hours to build their creations in soft sand that is free of shells and suitable for digging. Cactus Bay – Considered by many Waihekeans as the most perfect beach and, with nearby Garden Cove, a romantic place for picnicking. The beach is accessible only by boat or kayak, as its land access was blocked off by a private landowner. Shelly Beach – A small and well sheltered shell and stone beach located between Oneroa and Ostend. It has free BBQ facilities and a diving platform located just off shore. It’s a popular choice with families as at high tide, it is often very calm and flat – ideal for children. Waiheke Island has two primary schools and one secondary school. It is the only island in New Zealand, other than the North and South Islands, with a secondary school. Te Huruhi School is a state contributing primary (Year 1–6) school in Surfdale, and has 419 students.It opened in 1986 following the split of Waiheke Area School. Waiheke High School is a state Year 7–13 secondary school in Surfdale, and has 519 students. It opened in 1986 following the split of Waiheke Area School. Waiheke Primary School is a state full primary (Year 1–8) school in Ostend, and has 235 students.It opened in 2005.